The book examines specific aspects of marketing activities, such as ethical considerations in relation to young consumers, potentiallyharmful products and criticism of the societal impact of medical, arts and tourism marketing activities. 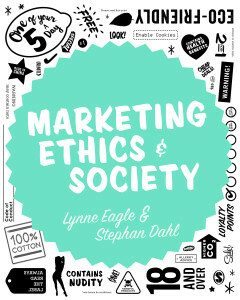 It then combines these with wider discussions of frameworks that enable marketers to respond to ethical challenges, supplemented by discussions of cross-cultural and international perspectives, consumer responses and ethical consumption movements as well as shifting historical perceptions of marketing ethics. The book is accompanied by a companion website including: PowerPoint slides and teaching notes per chapter, links to free SAGE journal articles and online videos selected per chapter by the authors, quizzes per chapter and links to further reading online. MORE additional material related to this book will be available from this website shortly! Stay tuned!